This chicken is packed with flavor and super easy to make! 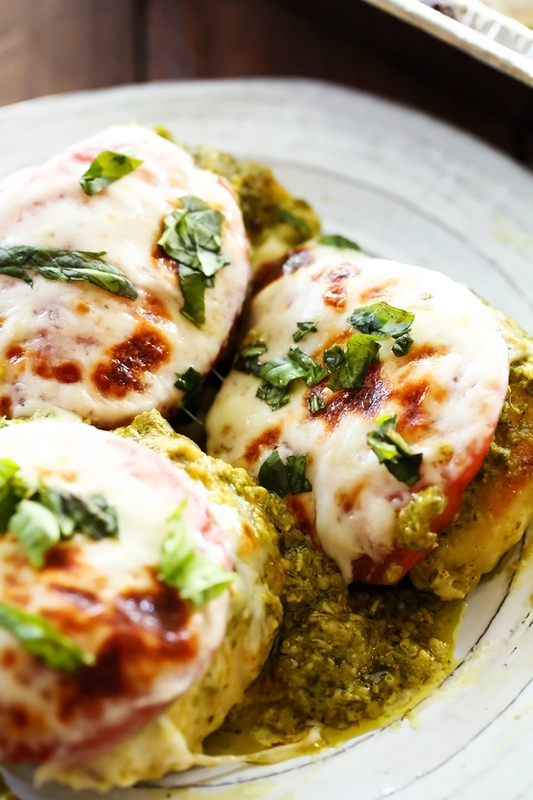 With delicious pesto, melty cheese and tasty tomatoes, this is sure to be a hit at the dinner table! In a small bowl, combine four, salt and pepper. Heat a large skillet on a stovetop over medium high heat and add the olive oil. When olive oils has been heated, dredge chicken in flour mixture and place in skillet. Brown chicken for 1 minute per side and place in a baking dish. Pour pesto over chicken and cover with foil. Bake at 350 degrees F for 40 minutes depending on the size of your chicken breasts until chicken is done and cooked through. Uncover when chicken is done and place a tomato slice on the top of each chicken breast. Place a slice of mozzarella cheese over the tomato. Place under the broiler until the cheese is melted.